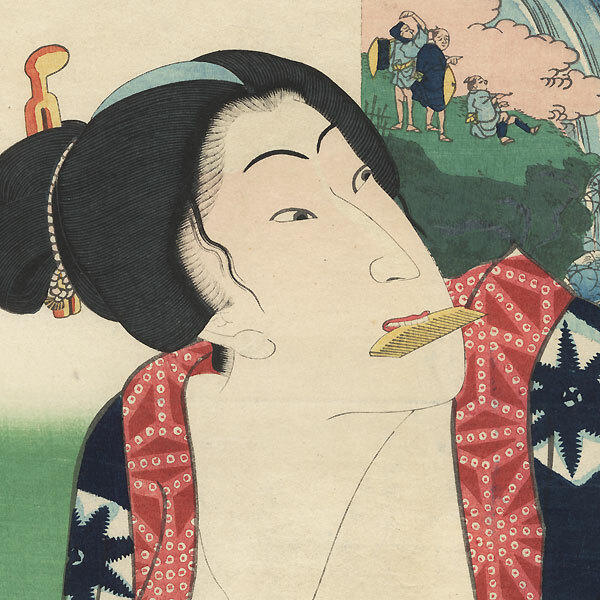 Comments - Attractive kabuki portrait of Sawamura Tanosuke as a beauty at her toilette. She wrings out a cloth, smiling as she looks up over her shoulder, a comb caught between her teeth. A dark blue tie-dyed kimono with a red tie-dyed collar is draped loosely over her shoulders. An inset at upper right by Toyokuni III's student Kunihisa shows travelers stopping to view a rushing waterfall with pink clouds drifting across the scene. An attractive design, nicely detailed with fine line work in the hair. Condition - This print with excellent color and detail as shown. Backed with paper. Small wormhole, repaired. Slight soiling, a few small spots. Please see photos for details. Good overall.